During our last 2 trips to Walt Disney World, our family decided to purchase the Disney Dining Plan. This was a decision that we always ponder about before adding it to our vacation package for a variety of different reasons. Before each visit and before we make our final decision, we list the pros and cons and then review the cost. Since our family is bigger than most and includes at least 3 adult men each time we visit, it normally ends up making sense for us to add it. During our last trip to Disney, we learned a lot about the Disney Dining Plan. 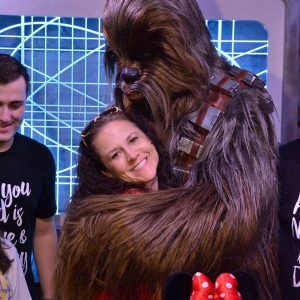 The Disney Dining Plan is not for every family, in addition, there are different levels of the dining plan which you can read here. My family and I normally choose the Disney Deluxe Dining Plan. It’s always way too much food and very pricey but it’s the plan that our family ends up voting for. 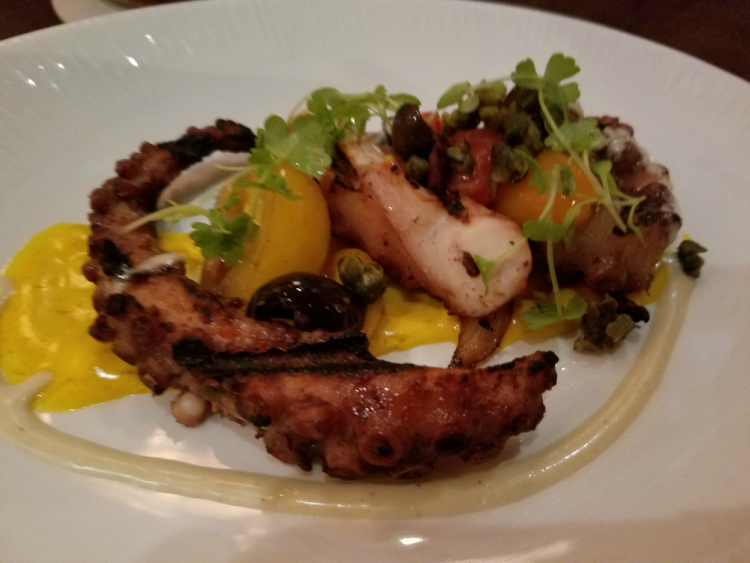 I’ve made a list, from experience, of some Disney Dining Plan Tips you need to know so that hopefully you will not only know the ins and outs of it but so that you will get your money’s worth. You don’t have to eat it all. The dining plan offers a lot of food to everyone in your party. Eat enough to make your tummy happy but make sure to avoid ending your meal with an overstuffed belly. 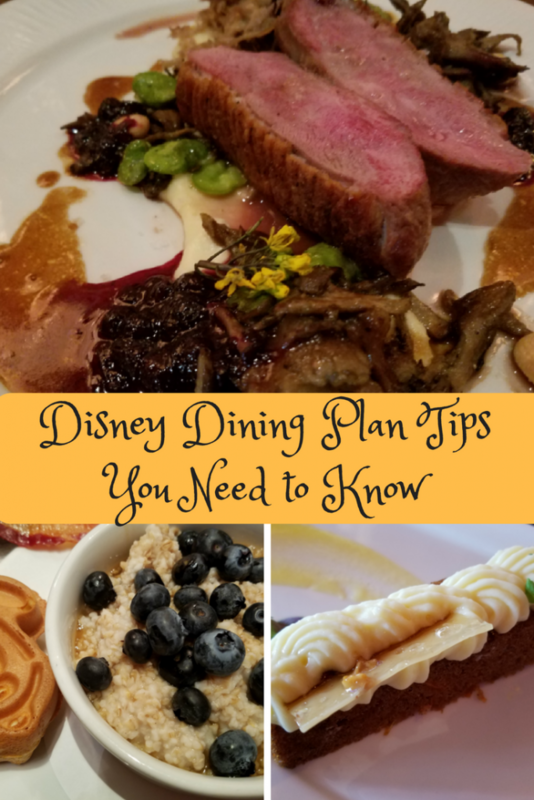 Even though the Disney Dining Plan includes an appetizer, drink, main meal and a dessert, does not mean you should feel obligated to get everything. Try and get everyone in your party to order something different. It’s fun to try a variety of different foods. Most restaurants will let your child order from the adult menu if they prefer. Don’t forget that even though you have purchased the Disney Dining Plan you are still responsible to pay a certain portion that is calculated based on the total amount of food and drinks that you ordered. This amount goes towards the tip. Referring back to #5- BEWARE! Since a certain percentage of the total of your food and drinks is totaled for tips, often times the wait staff will ‘encourage’ you to order the bottled water versus the tap water since it’s included in the Dining Plan or they will automatically serve you bottled water instead of tap water. They do this because it will increase the percentage of tip that they receive. During our last trip, on the last day, I was not hungry but knew that I needed to eat, so I ordered 1 pancake. Instead of bringing me 1 pancake, they brought me an entire pancake meal because it was included in the Dining Plan. I understand that the wait staff want to and need to make extra money but in my opinion, it’s important that they do it the right way, so be aware of this. As far as snack credits, never hesitate to ask a place that serves treats if they accept the dining plan . There is a little ice cream shop on the Boardwalk that accepts the plan. We would not have known this if we had not asked. Some establishments will offer certain snacks but will charge you 2 snack credits. Don’t let the idea of having to use 2 snack credits deter you from doing this. I promise that by the end of your trip, you will have leftover credits that you will not know what to do with. Utilize your snack credits at Epcot. There are so many tasty and different options in each of the countries. Often times, the waitress will let you order a milkshake as your beverage. If you do this be careful because Disney milkshakes are thick and very filling! Use extra snack credits for the pre-packaged snacks to give away to others as gifts or to eat for later. If you want to stretch your Disney Dining Plan, a lot of restaurants will allow you to plate share. Be smart when you are scheduling your dining. Make sure you schedule your dining in correlation to the parks you will be at. The first year that we used the Disney Dining Plan we didn’t do this and we wasted so much time because we had to travel from one park to another and then back to another park for dinner. We felt like all we were doing during our trip was eating and going from park to park. Before you schedule a restaurant to dine at, go online and review the menus. Not only will this let you decide if the restaurant serves the type of food that you and your family will eat but it will also give you an idea if the cost is worth using your dining plan towards. You want to make sure that you get your money’s worth when using the Disney Dining Plan. Before you decide to add the Disney Dining Plan to your vacation package, do your research. Make sure it is the right add-on for your family and then make sure you use it so you get the best value for your dollar. Has your family used the Disney Dining Plan? What tips can you share? Please pin this for others and keep scrolling for some more awesome Disney posts!